Yesterday, we received half a foot of snow outside and the kids have been outside enjoying the cold weather. 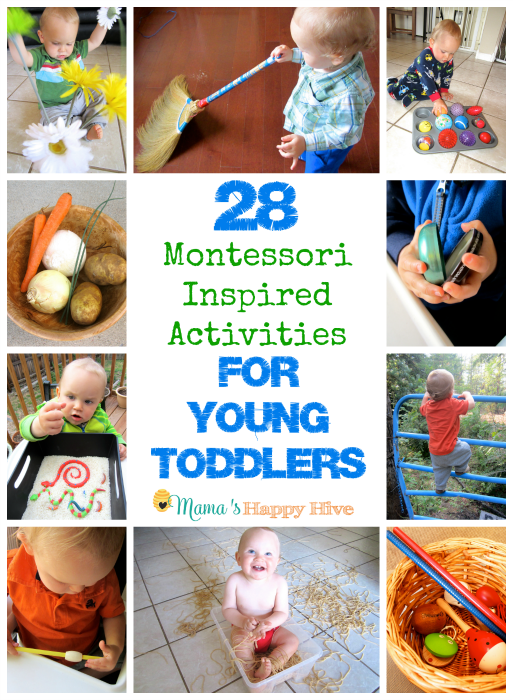 This was the perfect time to work on our Montessori Arctic Activities and Printables. 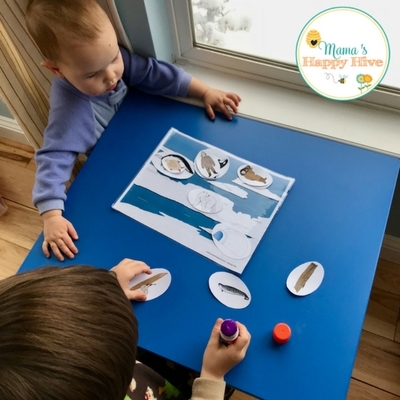 These printables cover the following activities: polar bear anatomy, polar bear life-cycle, Arctic animals, Inuit people, and a fun Arctic landscape with cut out figurines. 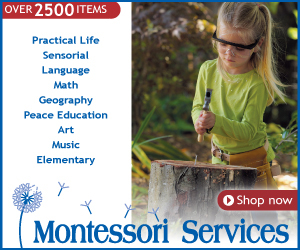 If you are looking for more toddler/preschool activities for learning about polar bears - visit our "Montessori Inspired Polar Bear" unit! Little Bee continues to work on expanding his vocabulary. 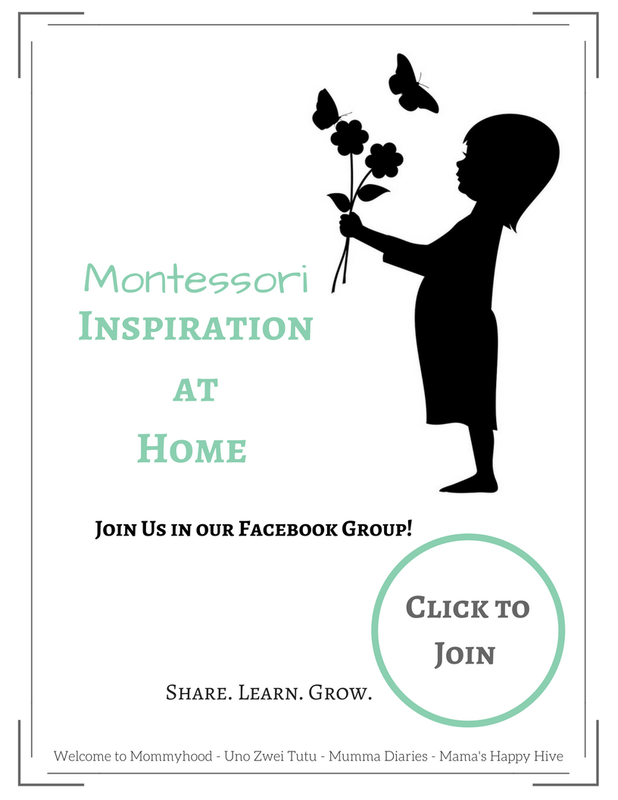 One way we do this in our preschool/homeschool is by learning anatomical parts of animals and using Montessori 3-part cards. Some of the unique words featured in these polar bear anatomical parts are hind leg, foreleg, snout, and muscle hump. These are fun words to explain the meaning of to your child. Also, I think it is really interesting to explore more into the hair of a polar bear. Did you know that their hair is not really white? Their hair is actually translucent and plays an optical illusion on our eyes when the light shines through the hair follicles. Also, did you know that polar bears have black skin? They have black skin to help keep them warm in the Arctic cold. The black color attracts the warm sunshine onto their skin. 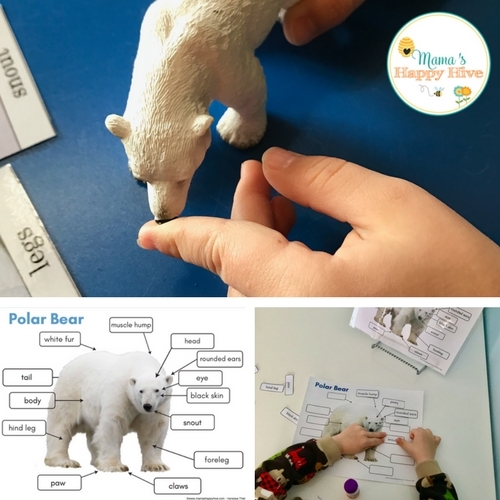 I created a cut and paste polar bear printable for the child to practice their cutting skills and then work on vocabulary development by matching the label on the template with the polar bear anatomy diagram. I created another cut and paste activity for the life-cycle of a polar bear. 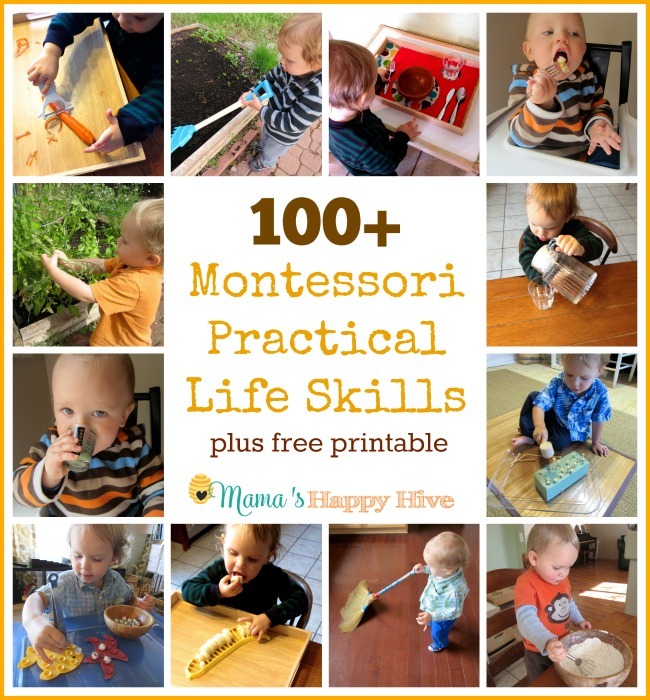 Little Bee worked on his "practical life" cutting skills with this activity. 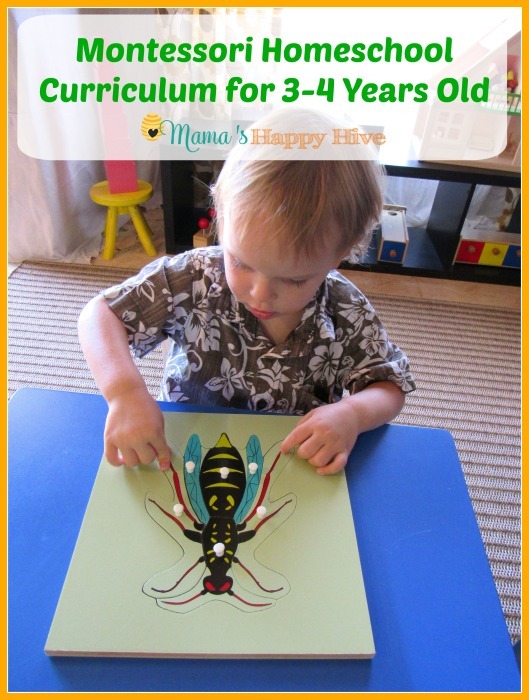 Cutting a round object out for a preschooler can be a fun challenge! 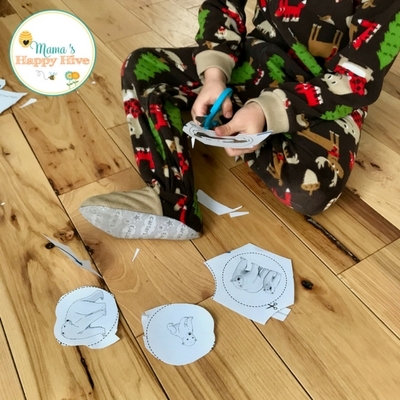 These are the polar bear life-cycle printables and activities. This set includes 3-part cards that highlight the maternity den, cub, adolescent, sow (adult female), and boar (adult male). The sow or pregnant mama polar bear digs the den out of a snowbank in the fall. Then two months later, her 12 inch long cubs are born. She usually has twins who weigh a pound each at birth. The mother will nurse her cubs in their den until the spring. Then the cubs will remain with the mother bear for about two and a half years learning how to survive in the harsh Arctic tundra. The boar (male) polar bears do not help with any of the raising of the cubs. The sow (female) polar bear does all the work. Included in this Arctic bundle are real images of animals that live in the Arctic Circle. These are 3-part cards that match the Arctic Safari Ltd TOOB. It's enjoyable for children to be able to hold a 3D object of the animal. The Safari Ltd TOOB allows the child that opportunity. This set also has instructions for how to use 3-part cards. 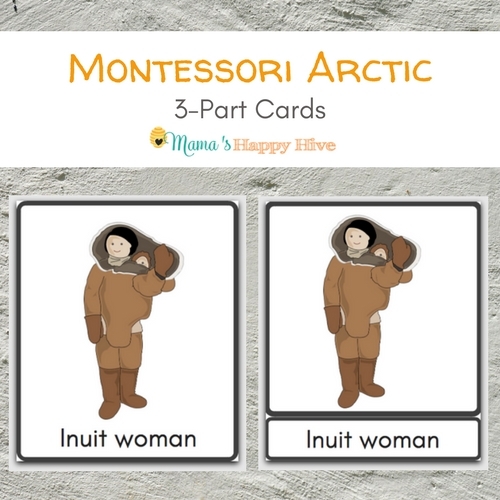 The final parts of this Arctic printable bundle are 3-part cards about the people who live there. 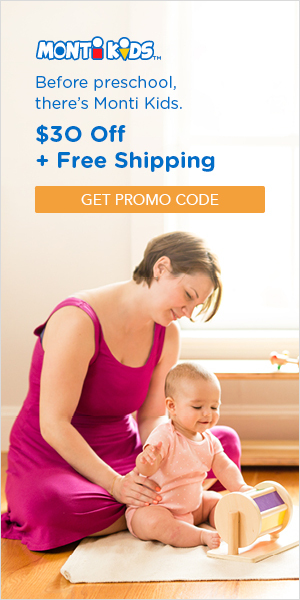 The set includes an Inuit man, woman, and child. Also, included is an igloo, kayak, and umiak. 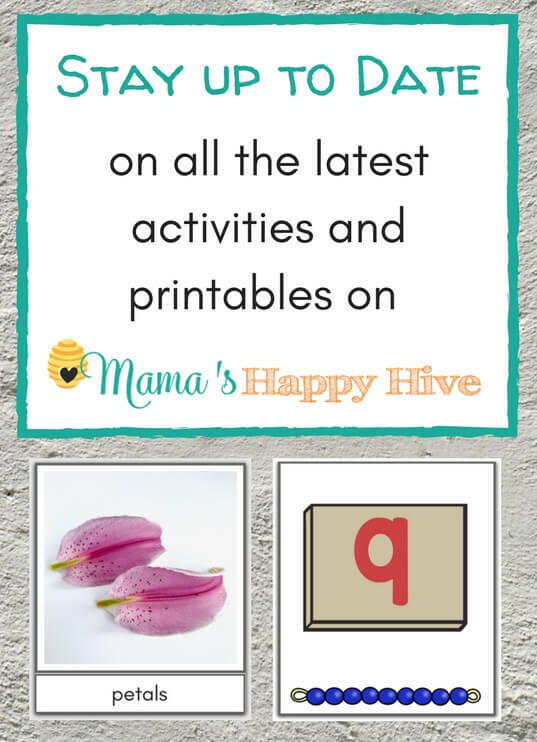 Little Bee loved the last part of this printable bundle featuring an Arctic landscape and several cut out images to paste onto the background. The images include the Inuit family, igloo, kayak, polar bear, and several different whales. The book "Baby Beluga" goes really nicely with this scene for the younger child (toddler). 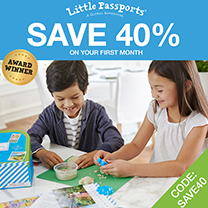 The older preschool aged child may enjoy learning about the Inuit people life style in the Arctic who survive by hunting the animals. Little Bee had his Inuit family riding on the backs of the whales which I thought was quite creative! 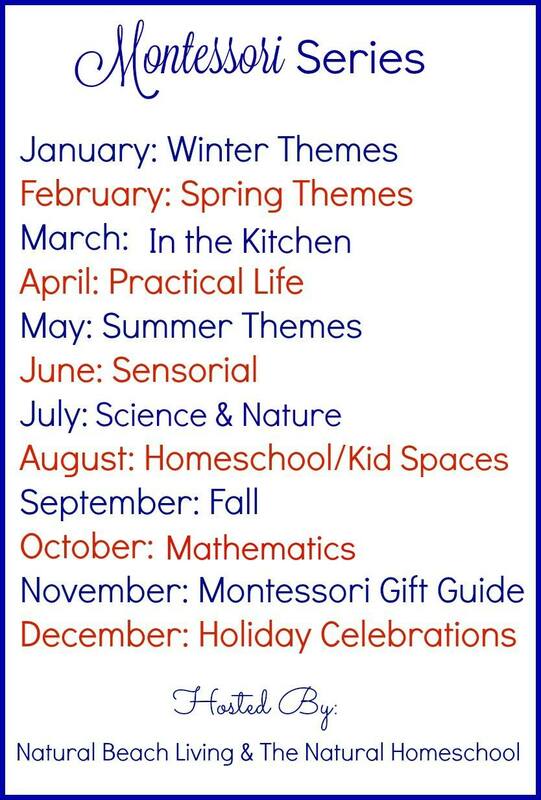 I hope you will enjoy these printables that I lovingly created for your child to use. 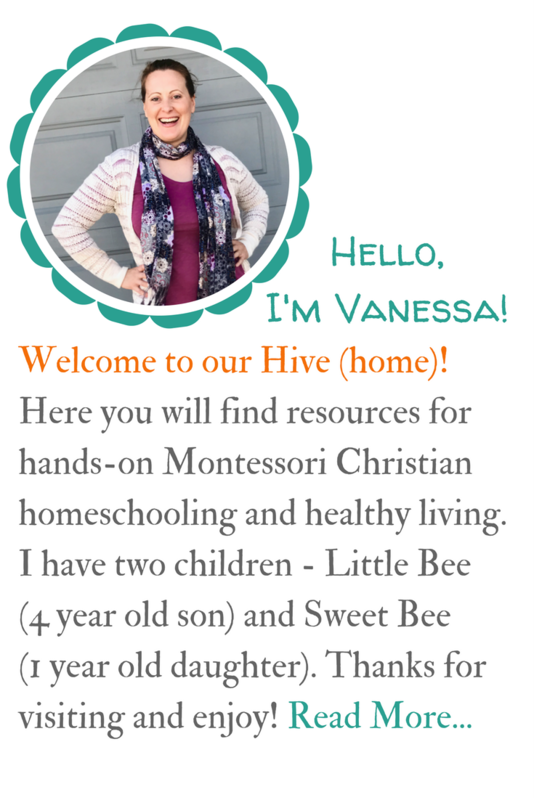 You can purchase your own set on my Mama's Happy Hive Teachers Pay Teachers shop! 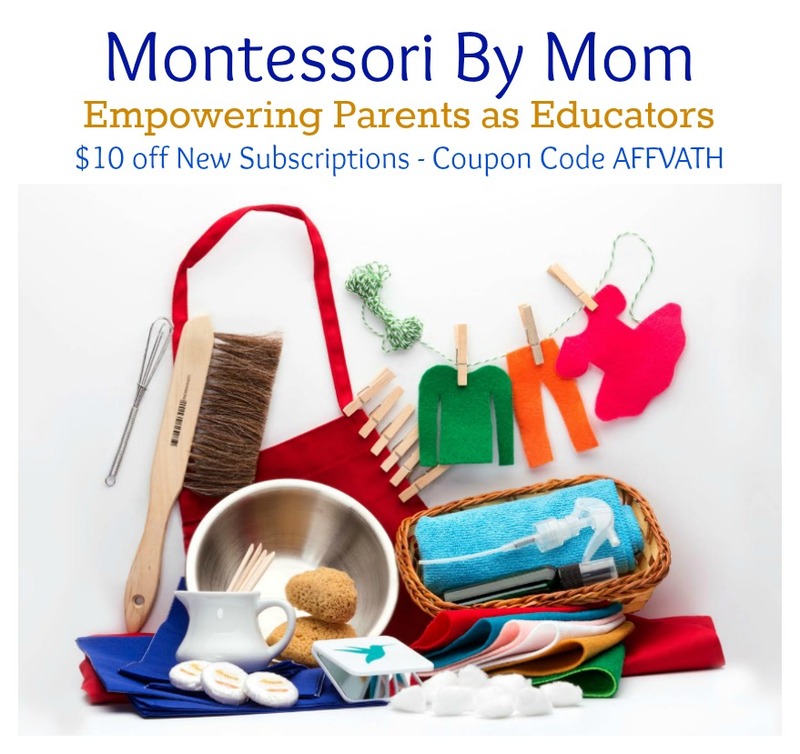 Thank you for helping to support my creative work. Please have a beautiful and blessed day! Super cute Vanessa! I specifically love the polar bear life cycle pack. These are so cute! 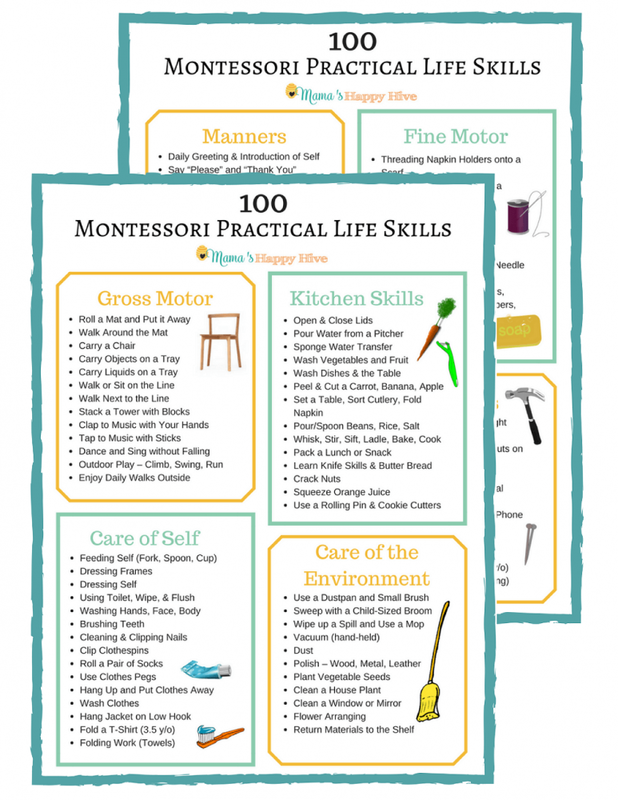 Love all of the pictures and printables. Hi there! 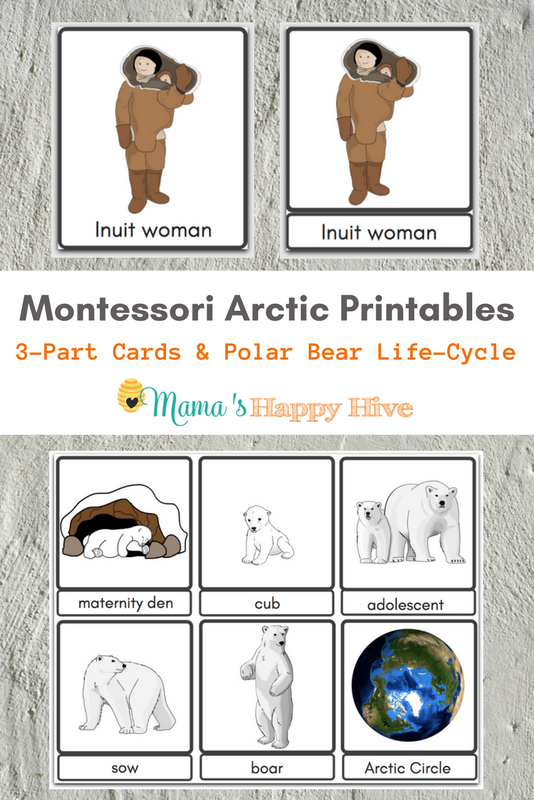 I could not find any printables for polar bear life cycle activity. Could you please help me with that?